Working with large documents can become a chore if you don’t have the right tools, particularly if you’re unfamiliar with the file you’ve been asked to work on. Often, the PDF format is used for documents that are inherently very large: user guides, textbooks and so on. Efficient editing tools make the job much easier. Infix PDF Editor will help you to manipulate the contents of large PDF files more efficiently. In the newest version of the software, a number of features have been added specifically for this purpose. Let’s quickly look at a few of them. When working with a large document, you need a good overview to understand how everything fits together. Infix PDF Editor has a new thumbnail view that really helps. You can see it in action right away: open a long document, such as the Infix User Guide PDF, and press the F8 key. (Alternatively, click View and then Thumbnails). The thumbnail view isn’t just an overview. You can use it to delete or move pages quickly using the handy graphical interface. Click on a page and drag it to a new location, or click a page and press delete to remove it. If you need to export text for translation, you may not want to export your entire PDF’s contents. Infix PDF Editor allows you to mark up certain blocks for translation, so you can export only what you need. To use this feature, you need to switch to marking mode: in the Document menu, click Translate and Mark Text Boxes For Export. Then, use the CAT Export feature to create an XML file suitable for importing into your translation software. Make sure the Limit to marked content only checkbox is ticked so that your XML export only contains the text you’ve marked. PDF files that contain a large number of images are likely to grow quickly; an image-heavy PDF file is likely to be too big to send via email, and that can present an inconvenience you might want to avoid. Infix PDF Editor gives you some control over the images in large PDFs so you can make them more lightweight. You can tell Infix PDF Editor to chop off any parts of images that are not visible. Infix does this by using a clipping mask. If your PDF file is becoming unmanageable, this will help to bring the file size down. Remember to save a backup in case you need to retrieve the full images at a later date. You can resample one image, a range of images or all of the images in the PDF. For example, you could convert all of your images to greyscale. If your PDF is so large that it’s no longer manageable, you could split it down into smaller files that are easier to distribute and maintain. 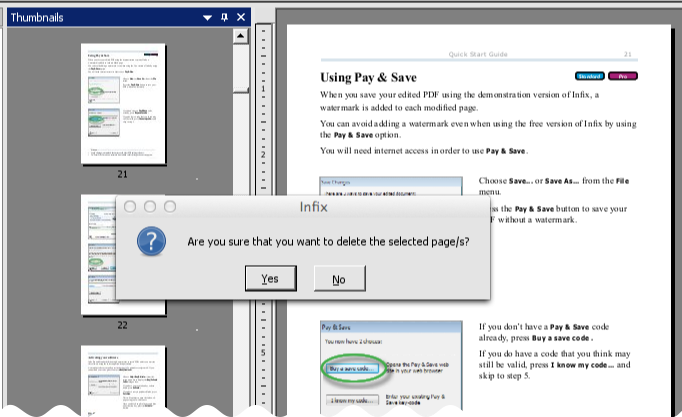 Infix PDF Editor has an Extract Pages feature that can export a chunk of a PDF to a new file. Extract Pages can be used to create a new PDF, an HTML version, a JPG copy, ePub or RTF document. Do you have a favoured trick to keep PDF file size down to a minimum? Let us know in the comments. Why are PDFs that have pages deleted as large as the original PDF?